If you missed the first ever Mayoral Forum on Parks issues you can watch the entire event at the below link. 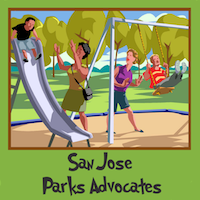 The San Jose Parks Advocates are grateful to the many community members who attended our forum on Monday, April 21. We are especially appreciative of Santa Clara County Open Space Authority, Committee for Green Foothills, San Jose Parks Foundation and the San Jose Stage Company for their help in putting on this great event.